POSH is a recognized leader in the design, manufacturing and marketing of office furniture. Their range ensures we can help you create dynamic and inspiring places to work. Their products are designed and backed by extensive research into how we work today and into the future. POSH products span system furniture, desking, seating and storage and all are manufactured in their ISO9001/14001 production facilities. 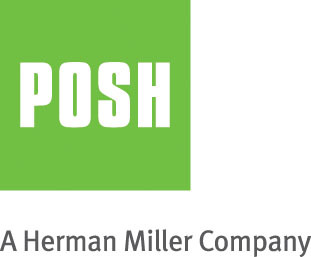 Sharing Herman Miller’s commitment to the environment, POSH’s office furniture solution is GreenTag approved and received LEED and GECA certifications and has been acknowledged by the Business Environment Council with the Eco-Business award. Renowned as a leader in the design industry; their ethos of “Better Design. Better Environment”, has seen POSH receive a number of awards including Best Office Furniture Brand by CAPITAL Magazine.